TRAVERSE CITY — NMC alumnus Ross and Brenda Biederman have been named the 2017 recipients of the NMC Fellow award, the highest honor bestowed by Northwestern Michigan College. 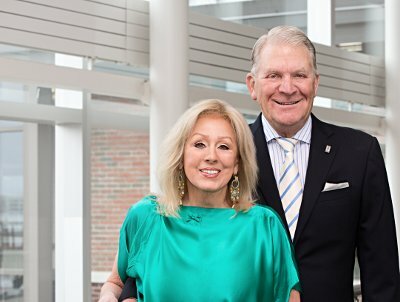 The couple has been a philanthropic and business force in northern Michigan for decades, winning the 2013 Distinguished Service Award from the Traverse City Area Chamber of Commerce. Virtually every sector of the community has benefited from their support, including healthcare, arts and culture, and education. Ross Biederman graduated from NMC in 1959, only a few years after the college was founded by a group including his father, Les. He was named an Outstanding Alumnus in 2010. Under his leadership, Midwestern Broadcasting Co. expanded to include nine radio stations. Ross Biederman also developed the Radio Centre complex, which includes downtown Traverse City’s first parking structure. As the head of the joint Garfield Township-Traverse City Recreational Authority, he helped develop the former state hospital grounds into the thriving residential/retail/commercial destination it is today. In the words of President Timothy J. Nelson, the Biedermans are an "empowering couple." Ross and Brenda have continued the Biederman family legacy of philanthropy. They have supported NMC personally and through the namesake family foundation for 30 years. Biederman scholarship funds currently support more than two dozen students annually and have transformed hundreds of lives. Most recently, the Biederman Foundation provided critical support for a simulator for the Great Lakes Maritime Academy. Ross is currently serving as a member of the NMC Foundation’s Campaign Steering Committee. Brenda Biederman, a Buckley native, is an equally wholehearted supporter of education in general and NMC in particular. She helped launch the Women’s Resource Center and the Maidens of Michigan and is a past director for the Michigan Council for Arts and Cultural Affairs. A fourth generation of Biedermans now has an NMC connection — one granddaughter is currently enrolled in the nursing program.